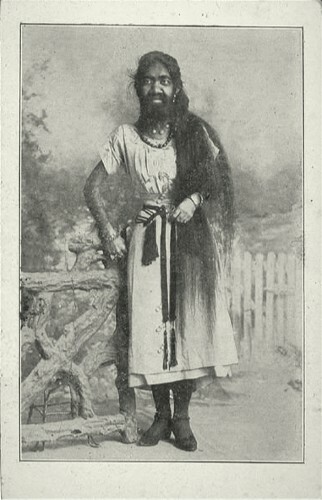 Krao Farini (1876 – April 16, 1926), also known as the Missing Link, was a sideshow performer and a person born with a rare condition known as hypertrichosis. Sideshow spielers flaunted her as proof of Darwin’s ideas. Krao was born is Siam (modern day Thailand) in 1876. From birth, the girl was completely covered with hair, including a mane-like track of hair flowing down her back from between her shoulder blades, and she was also endowed with supernumerary teeth (a secondary feature of hypertrichosis), hyperextensible joints, and prehensile feet, a common genetic variation in humans. Krao was first discovered at age six in Laos by scouts for the showman G.A. Farini. 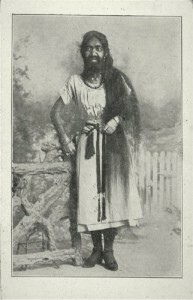 She established her permanent home in Brooklyn, where she worked at New York City’s numerous dime museums and at Coney Island as a bearded lady. She lived with a German couple, Mr. and Mrs. Jacob Zeiler, with whom she was close friends and could converse in German. She had her own apartment in the Zeilers’ building, where she cooked and kept house for herself. Her favorite hobby was the violin. “Music makes me happy here,” she said, gesturing to her heart. Entirely self-taught, she played by ear in a style that was more folk than classical. She also loved to crochet and was quite fond of books. On the streets of the city she kept her beard covered with a veil.